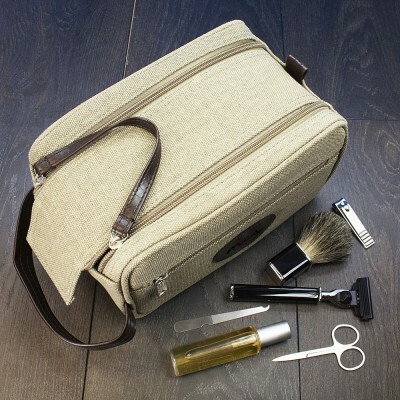 This classically styled canvas wash bag is designed with travel in mind. Lightweight and hardwearing this bag is perfect for everyday useas well as travel. With a wired top once opened the bag stays upright handy finding those small essentials! The exterior has a large lined zipped pocket giving him even more room. The double zipped top closes shut with tough velcro and the large handle is perfect for travelling. Made from canvas and PU leather.